March 13, 2019, 5:30 p.m. 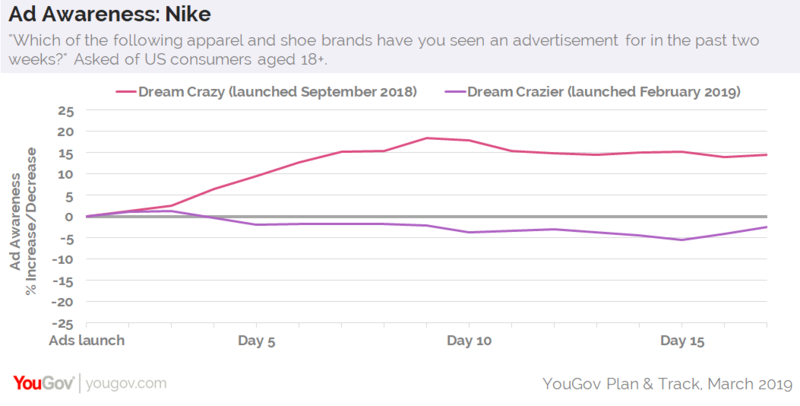 Early evidence from YouGov Plan & Track suggests that Nike’s recent Dream Crazier ad push, featuring Serena Williams, isn’t generating the same amount of attention among the general public as its Colin Kaepernick-narrated Dream Crazy spot launched last September. 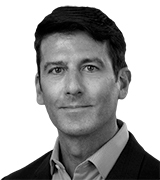 Since Dream Crazier’s release in late February, the number of US consumers who recall seeing an advertisement for Nike in the past two weeks has remained relatively stable. Soon after the release of Dream Crazy, however, the number of shoppers coming across a Nike ad climbed nearly 20 percentage points. Likewise, Nike’s Word of Mouth metric — which gauges how many consumers are talking about a particular brand with friends or family members — has remained flat following the launch of Dream Crazier. After Dreamy Crazy, the number of US adults discussing Nike rose nearly 25 percentage points. YouGov data shows that part of the big splash behind Dream Crazy was likely the controversy. In total, 59% of all US adults have a positive opinion of Williams, making her one of the most liked sports personalities in America. Only 35%, meanwhile, hold a positive view of Kaepernick. Further figures show that people who have a negative view of Kaepernick are nearly five times more likely to say their view is strongly negative than slightly negative, making the former NFL quarterback a polarizing personality and spokesperson. On the other hand, a YouGov poll conducted late last September found that the country is highly divided on Kaepernick’s signature cause: NFL players kneeling during the national anthem to protest racial injustice. In total, 41% of US adults support the act, 20% don&apos;t support it, but think it should be allowed, and 26% don&apos;t support the act and don&apos;t think it should be allowed. A few days prior to the launch of Dream Crazier, Duke University&apos;s star basketball player, Zion Williamson, suffered an injury after his Nike sneaker broke apart within the first minute of play against the University of North Carolina Tar Heels. Consumer perception of Nike dropped following the incident. At present, 67% of current Nike customers have a positive opinion of Williams, while 43% have a positive view of Kaepernick — both numbers being higher than the general public’s impression of the two athletes. As to whether brands should create advertisements around current events, 61% of Nike customers say they like brands that are willing to get involved in social issues, compared to 46% of the general public.